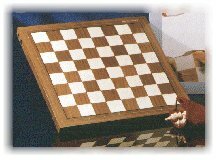 The Tasc SmartBoard is a tournament size wooden chessboard. It is handcrafted in walnut with inlaid squares. Matching wooden pieces of Staunton model complete this beautiful and practical set. Advanced electronics in the board as well as the pieces identify each piece and register its position on the board. Piece recognition guarantees maximum reliability in play, as well as maximum freedom in analysing and setting up positions. With a completely renewed electronic interior, the SmartBoard has reached the third generation of technology, referred to as the SmartBoard III. It is the most advanced electronic chessboard that has ever been made. SB 20 The well-known version with 64 + 2 LEDs. It has a LED (small light) in the lower right hand corner of each square to indicate the moves and two colour-to-move LEDs. SB 30 The beautiful board with 81 LEDs, re-introduced in 1997. It has a LED placed exactly at each of the four corners of each square. It provides the highest comfort by lighting all four LEDs to indicate a square. How to use the SmartBoard? The SmartBoard is an electronic chessboard. It has to be connected to a computer, either a PC or the Tasc R30 module. You can play against the computer. Your moves on the board will be automatically recognized and the computer's answer will be indicated by LEDs on the squares. This means you can focus completely on the board and you don't have to watch a screen or push buttons. Another possibility is computer-aided analysis. Freely analyse your game on the board. It will automatically recognize any position and the computer will calculate along. Take a glance at the screen and display and you know what the computer "thinks". The SmartBoard can be connected to any (IBM-com) personal computer with a sthrough the standard printer-port) the SmartBoard serves as an input-device for chess games and positions. This opens possibilities previously unseen. Playing games on a normal chessboard, while still having all the advantages of using a PC-program; storing the games permanently, analysing with the program, printing the game score, etc. The SmartBoard is particularly well suited for use with the Tasc programs TascBase and Chessica. Chessica provides a strong opponent, while offering the maximum in user comfort. TascBase has all the advantages of a full-featured database program for the demanding user, and has an integrated chess program for playing games as well. Also refer to the TascBase and Chessica information pages. Apart from the Tasc programs mentioned, the SmartBoard can also be used with the latest versions of third party chess programs like MChess Pro, Hiarcs, Chessmaster 5000, Rebel, Fritz, Genius and Kallisto. If necessary, drivers for these programs are included with the SmartBoard. The SmartBoard together with the R30-module forms a stand-alone chess computer of the highest class. A splendid combination of design and advanced electronics. Also refer to the R30 module information page. The SmartBoard measures 42 x 42cm (16.5" x 16.5") with squares of 4.5 x 4.5cm (1.8" x 1.8") and it is only 23 mm (0.9") thick. The pieces are Staunton size 4, with a king height of 78mm. Prices depend on the SmartBoard version (SB 20 or SB 30) and package (the SmartBoard somes with either Chessica for Windows or the TascBase 2.0 introduction bundle). Prices can be found on the price list.